This page allows you to control your personal settings, including your contact information, country, time zone, and photo. You can also change your password from this page. 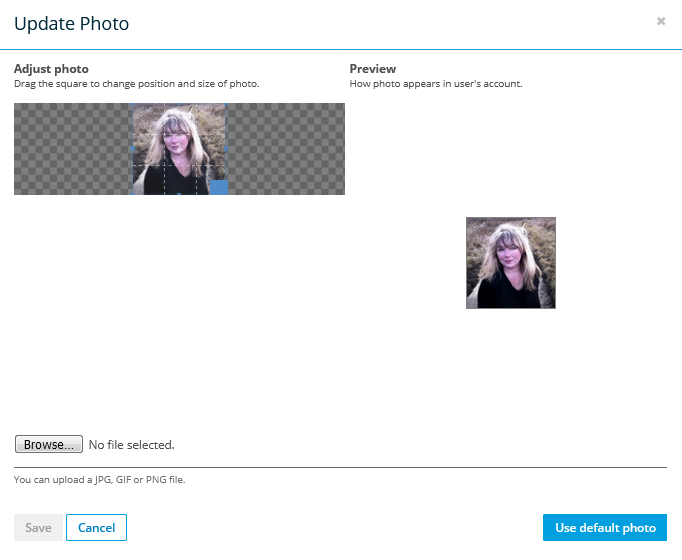 To adjust the cropping of the photo, use the blue box to adjust the crop area and skip to step 6. To upload to photo, click Browse. Navigate to and select the image file you wish to use. Use the blue square on the image to adjust cropping. A preview appears on the right. If Active Directory integration in enabled, you will not be able to amend these fields. Refer Active Directory Integration Guide. Edit your name, email address, and/or phone number. Remember to select the appropriate country code for your phone number from the list. To edit your country, time zone, and/or regional settings, make selections from the dropdown lists. If you want to receive Workplace"Workplace" describes the Autotask Workplace service in its entirety. notifications via text message, select the Allow Workplace to send you Text message notifications check box. To stop receiving text messages from Workplace, clear the check box. If Active Directory integration in enabled, you will not be able to change your password. Refer Active Directory Integration Guide. Enter your new password. Password strength requirements depend on the policy profile assigned to you by your administrator. Refer to Policy Profiles. If your password does not meet the password strength requirements, a red X and a message will display. The strength meter will indicate how secure your password is. Re-enter your new password to confirm it. If the passwords you have entered do not match a red X displays next to the Confirm Password field and the Change Password button remains disabled. To close this popup without changing your password, click Cancel.